when I hear trees rustling in the wind at evening." #14 of 30 - "Paintings Inspired by Quotes About Trees". What do you think about this series so far? I am still excited about my theme. The ideas just keep coming! If you have any suggestions or requests, I'd love to hear them. OOh, the color and movement in this painting is very nice and so is the great quote. I am working terribly hard to keep up with the pace of the daily painting! 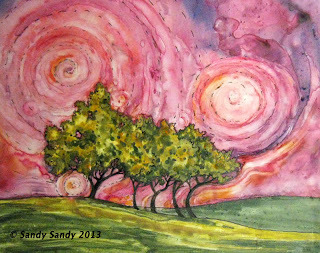 rustling wind and whirling pink clouds...I love how you made the whole painting move and sway.